The Study Group of Stellenbosch Architects presents an exhibition of the architecture of the town over 300 years in the University Art Gallery in Dorp Street – better known as the Old Lutheran Church, designed in 1851 by the architect Carl Otto Hager. This edition of the exhibition gives a concise but balanced view of the architecture of the town. The exhibition is also conceived as an illustrative summary of and supplement to Mr. Hans Fransen’s article Three Centuries of Architecture. 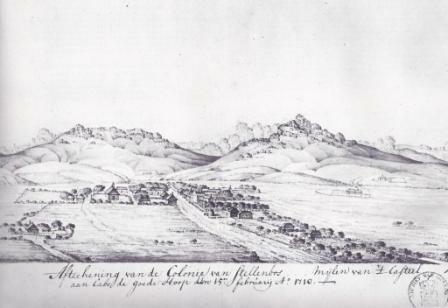 Following the discovery of the valley on 8th November 1679 the “Colonie van Stellenbosch” began as a settlement of “Vryburgers” one of whom was Jacob Brouwer on the farm Doornbosch which was restored during 1979. Four considerations led to the founding of the village in 1685 – church with a churchyard; a Landdrost office on the island; residential plots between the public buildings and the “Wagenweg naar de Caab”- the Dorp Street of today. The town plan was influenced by the various routes to farms, and the first dwellings arose around the “Groote en Kleine Kerkstraat” intersection, or what forms today the heart of the historical town centre. By the time of the devastating fire 1710, the agricultural village consisted of a dozen simple longitudinal houses, the church and “Drosdy” huddled together on residual ground between the farms. Buildings were constructed of available local materials with white lime washed walls and predominantly hipped-end thatched roofs. Schumacher’s portrayal shows very little development after the fire of 1710. After almost a century the village had only 300 white inhabitants and 40 to 50 houses along two broad streets, namely Kerk Street and Dorp Street. Situated on a new site to the windward side of the village, thereby minimising the fire hazard, the new cross-shaped church formed a most pleasing eastern termination to Kerk Street, similar to the focal position of the new street, today’s Drostdy Street or the “Beplante Plein” as it was then known. Indeed a worthy town layout with the two most important public buildings occupying prominent sites in a manner which allowed for a beautiful relationship between themselves and with the street scene. Plein Street was a avenue of oaks bordered on the north by farms. During this period the branch of the river was diverted from the village back to the main stream. Most of the houses still hipped on half-hipped end gables, but the parsonage on the corner of Dorp Street and Louw Street boasted a full-end gable as well as a full-height central gable and large sliding sashes with half shutters. A second fire broke out in 1763 and as before, the Drosdy had to be rebuilt. 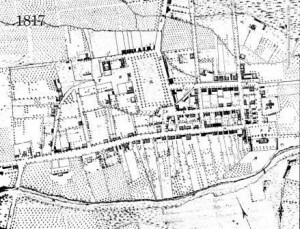 The map of 1817 by Surveyor Hertzog shows how the layout of the town centre was completed. The layout became a thing of beauty as the irregular grid pattern wove itself into the organic unfolding of the town scape. Streets formed dead-ends on important buildings such as the Church, Drostdy and Prison or widened out into open spaces such as Braak. Add to this the curving roads, and the town centre became a place of thoughtful confines of intimacy, of easy orientation and of changing vistas. The Braak or “Koningsplein” was a neatly defined commonage with twin oak lanes, encircled by buildings on Bird Street and Alexander Street including the “Kruithuis” on the west side. During 1803 a third fire ravaged some 42 houses which were soon rebuilt, some with a change in style. Gabled homes become double-storey dwellings with flat roofs to reduce the fire hazard. During this period of revival the town virtually trebled to approximately 120 houses. A closer juxtaposition of dwellings resulted in continuous street facades which later were to become so unique. At first growth was unsuccessfully stimulated northwards in an unimaginative grid pattern. Semi-detached houses were erected here as well as in Bird Street, Meulsteeg, Dorp Street and Herte Street. More important public buildings, notably churches, were erected: The Cape Dutch Rhenish Church in 1823; the Cape Gothic St. Mary’s in 1852; the Cape Gothic Luthern Church in 1853, the Wesleyan Church in 1875 and the Cape Gothic revival style “Moederkerk” in 1863. The township showed little expansion but became more densely built-up with some 175 houses by 1859 of which 15-20 were double-storey homes. Plan adaptations and style variations were commonplace. The buildings in the town centre collectively formed street walls. Together with the supporting fabric of ancillary structures and reflecting a similar scale, details and use of materials they harmonised to form a unique architecture of uniformity and continuity. Knitted together by the binding elements of furrows, greenery and intimate shadowy street areas, the town one can visualize is one of exceptional beauty and has been described by Fransen as “A primarily Cape Dutch thatch roofed town with a sprinkling of stately Georgian and early Victorian buildings which lends to it the quality of a quiet though substantial regional capital – Stellenbosch probably at its most picturesque”. A fourth major fire struck the town in 1875. After the fire of 1875 gables were removed, walls raised, roofs lowered, facade proportions distorted, and modern doors, windows, balconies and verandas added. Thus the traditional architectural idiom was eroded and the corrugated iron period, which gave greater freedom to the expression of individual tastes and idiosyncrasies, had started. On the stony plain to the north of the town centre, long rows of houses had been let to the coloured community. Further growth extended in easterly and westerly directions on the fertile river terraces. Imposing corrugated iron Victorian villas with quaint towers and elaborated cast iron verandas and trimmings appeared on large plots in Van Riebeeck Street and Herold Street. After 1902 Mosterdsdrift developed into an elite residential area and veterans of the Anglo-Boer War were housed in Karoo-type flat-roofed houses in The Avenue. More double-storey dwellings appeared in Plein Street and Dorp Street, and, with the introduction of similar structures in a High-Victorian style for commercial purposes the town centre acquired something of an urban character. The erection of more ambitious and monumental buildings to house important educational institutions, such as the Victorian College 1881, the Theological Seminary and Conservatoire for Music, both erected in 1905, and Bloemhof School 1907, probably reflects the most important change of this period. By the year 1914 Stellenbosch presented an incoherent town scene characterised by disharmony between buildings and also between the historic town centre and newly developed areas. This transitional period, which endeavoured to meet the demands of the modern era, was impeded by the disruptive effects of two world wars and the recession. This seriously affected the architecture of the time. However, progress in the agricultural and educational sectors stimulated growth and led to a more intensive utilisation of the established town centre and of the recently established residential areas. Plein Street and Bird Street developed into the central business area and by firstly adding larger windows, then verandas, and later on further adaptations and ultimately the total demolition of structures to give way to new commercial buildings or flats, numerous historical buildings were lost. With the appearance of motor vehicles, the tranquil and safe atmosphere of the streets was soon transfigured. Essential services such as sewage disposal, electricity, storm water drainage, road widening, including pavements and road signs, followed and man made Stellenbosch became more and more complex. The designers of buildings struggled to give architectural expression to the new way of life and the technology and ideas of the modern era, whilst at the same time they endeavoured to find aesthetic connection with the historical townscape. The lack of a pure analytic creative ability for such a difficult challenge is clearly reflected in the proliferation of pseudo Cape Dutch buildings. Accelerated development took place and new residential areas such as Krigeville, Dalsig, Onder-Papegaaiberg, Karindal and Union Park, were established. Many new schools, university buildings, research institutions and industrial and commercial buildings were erected. Bird Street and Dorp Street underwent great changes. A rapid rise in the population demanded a new type of accommodation and this led to the erection of many blocks of flats. Student enrolment grew from 1 800 to 9 000 while the number of motor cars soared from 1 800 to over 20 000. The effect of an exploding post-war technology and knowledge, the ever increasing variety of building materials and the emerging importance of commercial promotion, collectively helped to create an atmosphere of indifference towards the past. More and more historical buildings were replaced by international suburban commercial structures characterised by a multitude of forms and a bewildering variety of materials. Some institutions and designers still follow slavishly a pseudo approach to architecture. The destruction and loss of historical buildings, coupled with the influx of foreign elements of doubtful qualities, fostered a deeper appreciation for the values of the past, and thus was born the pioneering activities of conservation and restoration – probably the most important contribution of this period. A new generation of architects, educated to respond to the challenges of the modern age, rebelled against the prevailing stylistic confusion and the poor quality of the architecture produced. Their fundamental and rational approach eventually came to fruition in the emergence of hopeful signs for the evolution of a meaningful contemporary idiom. Continued growth has been experienced at all levels. New townships have been proclaimed in Cloetesville, Brandwacht and Die Boord. The existing residential and business areas have developed more intensively and vacant sites are scarce. North Merriman Avenue the development remains sluggish, as in the past. The central business district has undergone major changes. Commercial buildings blend with the historical character of the town with varying degrees of success. The increase in public amenities is reflected in the unprecedented provision made to accommodate the motor car by way of cellar parking, roof parking, municipal toll parking, parking meters, vehicular encircling of the Braak, traffic lights, road widening and diversions. The Municipality of University have undertaken commendable improvements enhancements such as pavements, the “meulsloot”, campus gardens et cetera. For the fast expanding University the long awaited era of meaningful contemporary academic architecture has at last materialized and a number of notable buildings have been erected. The most encouraging aspect of this period is the emergence of a promising contemporary architectural idiom, particularly in view of the extended efforts, indifference and experimentation of the preceding decades. A sensitive approach to sympathetic and justifiable neighbourliness between historical and contemporary buildings, while maintaining the unique Stellenbosch character, has already produced a number of valuable contributions. Twentieth century domestic architecture in Stellenbosch, especially along “Noordwal”, Van Riebeeck Street, in Mosterdsdrift and in the new residential areas, reflect a sympathetic understanding of the way of life and ideas prevailing in different periods. The general quality of the architecture is of the highest in the Western Cape. Since 1952 the excellent work of Pius Pahl, the Bauhaus trained architect, has continued to delight many families and has inspired his colleagues. Post-war dwellings are characterised by a functional design approach which emphasizes an informal life pattern and efficient spaces, facilities and equipment. Modern technology, the wide range of materials available, and the personal requirements of the owners have stimulated innovation and produced a great variety of expression and character. Very noticeable is the prominent role played by the motor-care, car-port or the garage in the street scene of residential areas. The traditional “room-and-passage-planning” for living spaces, accompanied by small wall openings for doors and windows, was replaced by open planning. Interior and exterior spaces have been functionally and visually integrated through the use of extensive glass walls, doors and planting. Orientation towards sun and vistas has become more important than imposing street facades. The most successful contemporary Stellenbosch dwellings respect the traditional building materials and colour schemes and display such qualities as restraint and dignity which harmonise well with the nature of the town. As stated elsewhere, a consciousness for preservation and restoration evolved and grew against the background of a loss of historical buildings owing to indifference and town development. The extent of this achievement is illustrated on the Hertzog map of 1859 on which the restored buildings are marked in black. A further number of =buildings have been saved from demolition but still need to be restored. Apart from the magnificent contribution of restoring and preserving several authentic pieces of historical Stellenbosch, this movement clearly engendered a deeper feeling and understanding for local architecture amongst laymen as well as architects. It would be difficult to believe that the emergence of a contemporary idiom sympathetic towards the historical heritage could have developed independent of such movement. 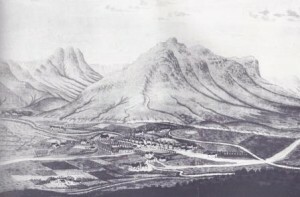 There are however, three alarming phenomena which demand rethinking: the erection of new Cape Dutch buildings; the intention to erect a replica of an old Stellenbosch building in new surroundings and restoration word undertaken with indifference or not under the control of knowledgeable persons. The finer urban detail such as street furniture, municipal technical services, pavements, planting, display, notice boards and signs can contribute to, and complete the general town scape provided they have been conceived and executed with the necessary sensitivity. Thanks to the appreciated efforts of the Municipality, the University and certain private owners, much has been done to improve the Stellenbosch townscape. However, there is still room for improvement. In the preceding review and detailed evaluation of the architecture of Stellenbosch, the characteristics and qualities which knowledgeable professionals and understanding persons consider positive and in keeping with the local context were naturally stressed. There exists, however, the counterpart which cannot be accepted as belonging to the mainstream of our architectural heritage and the reasons for its existence are numerous and universal: blatant indifference; deficient design insight and ability; insensitive or limiting design briefs or lack of positive guidance by the designer. Since the town scape comprises all buildings, a few examples of such controversial structures are features in the exhibition. The organic layout of Stellenbosch is an unusually successful town structure. Because several streets are terminated visually or widen into open squares, the town centre became clearly defined with easily recognised elements of reference. Streets often change direction to present exciting new scenes of an intimate nature. Buildings collectively form “street walls” behind screens of oak umbrellas. Ever present is nature with its mountains, trees, birds, squirrels, water and the Eerste River. This inspiring framework generated an architecture of fitting characteristics with superlative qualities.